Christmas, New Year and celebrations can cause concern for those who do not want to put on too much weight. It is possible to have a good time, enjoy the partying and avoid weight gain by following a few essential rules. 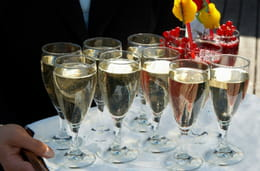 Choose a glass of champagne which amounts to about 80 calories per glass where as a glass of whiskey for example which can reach more than 200 Calories. Choose alcohol that is low in carbohydrate such as spirits with a low calorie mixers (Gin and Vodka) and white wine. Latest update on November 21, 2010 at 11:42 AM by Janey39. This document, titled "Healthy party menus: drinks and appetisers," is available under the Creative Commons license. Any copy, reuse, or modification of the content should be sufficiently credited to CCM Health (health.ccm.net).